Why Should I Choose You This review first ran in the April 27th edition of The Hamilton Spectator. You’re in a room with a bunch of other smart people. You’re there to chart the future for your organization. There’s flip charts and Post-it Notes, binders full of facts and stats and no shortage of opinions and a couple hundred ideas. You’re asked to answer two big questions. This is when you need to put up your hand and say there’s an even bigger question that needs to be answered first. Most organizations don’t have a clue. Some have a vague idea that no one can easily articulate. Not knowing the answer to this question will lead you down some wrong paths and have you sail past some great opportunities. “The question that has to be answered first – who are we? 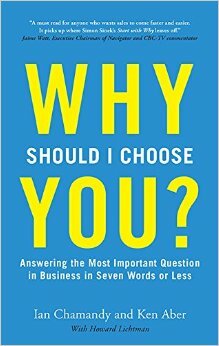 – is one that organizations either don’t typically ask at all, or they pay lip service to answering it, or they try to answer it in a way that is so superficial as to render it meaningless,” say Ian Chamandy and Ken Aber, authors of Why Should I Choose You and founding partners of Blueprint Business Architecture. If asking “who are we?” is too much of an esoteric or existential question that will leave heads spinning and meetings running on indefinitely, try answering this related question instead. Why we should choose you? Why should we buy what you’re selling? Why should we invest in you? Why should we join forces and go into business with you? Why should we be your customer, client, member, patient or student? The answer will eventually lead you to your organizational DNA that makes you uniquely distinct. You’ll know it when you find it. You’ll have your a-ha moment. Chamandy and Aber call this your organization’s core proposition and you need to wrestle it down to just seven words or less. Some organizations can do it in just two words. The seven word limit forces you to be clear, concise and compelling. You’ll remember your core proposition and everyone will understand it. Chamandy and Aber have built a business around helping organizations find their core proposition. You need to look at what your organization really does as opposed to what you think it does. And you need to figure out what deep emotional need is being met by your organization. “We tear the company apart so that it is in pieces on the table, at some point in the conversation the core proposition pops out, we bulletproof it and then we reassemble the company around the core proposition,” explain the authors. You can then use the core proposition to drive all the decisions you make about where to take your organization and how to get there. Your core proposition will reveal business opportunities you’ve overlooked and help you steer clear of costly misadventures. It will also inspire and focus creativity among your workers and staff. Chamandy and Aber recap their work in helping create core propositions for organizations including Baycrest (innovation in aging), Longos (treating you like family), United Van Lines (a higher standard of care), Emeritus Financial (following the smart money) and Navigator (when you can’t afford to lose). Their book will leave you with one question. What’s my organization’s core proposition? This review first ran in the April 13 edition of The Hamilton Spectator. I spent a small fortune to learn a valuable life lesson. I was one of those kids who bought comic books and hockey cards. I faithfully rode my bike or the bus to comic book stores and card shops every Saturday. I forked over every dollar I earned cutting lawns, shoveling driveways, delivering newspapers and catalogues, babysitting, washing dishes and bussing tables. As the comics and cards piled up, I fooled myself into believing this was less an out-of-control habit and more of a smart long-term investment. Mint condition X-Men comics and Eric Lindros rookie cards were my college fund. The proof was in the price guides put out by collectors who made their livelihood off selling to kids like me. In the end, my investment yielded a return of about a half cent on the dollar. I traded my cards and comics at used bookstore for just enough cash to buy two textbooks and a one-month bus pass. But I also left with a newfound appreciation that something’s only worth what someone else is willing to pay for it. That was a lesson lost on everyone who got caught in Beanie Baby mania in the late 1990s. Otherwise sane grown-ups spent hundreds, and even thousands, of dollars on toy animals shipped by the millions from Chinese factories and sold in stores for $5. Beanie Babies were the brainchild of entrepreneur Ty Warner, dubbed the Steve Jobs of plush. In 1998, Warner’s company rang up sales of more than $1.4 billion. Warner’s pretax income was a whopping $700 million. One saleswoman earned more than $800,000 in commission selling to toy and gift shops in Chicago’s northern suburbs, which was ground zero for the Beanie Baby craze. Beanie Baby mania peaked at the same time as the Internet stock bubble. Warner’s toy company was one of the first to launch a website in 1996 where collectors bought, sold and swapped Beanie Babies. eBay soon followed and Beanie Babies accounted for 10 per cent of initial sales. In May 1997, the auction site sold $500,000 worth of Beanie Babies at an average price of $30. Warner also did a masterful job of driving up demand. He’d drop hints and then retire Beanie Babies to send collectors into a frenzy. As the secondary market overheated online, adults bought whatever new Beanie Babies hit store shelves. Warner only shipped small orders to independent toy and gift shops to fuel the chase for collectors. There were never bins of Beanie Babies for sale at Walmart or Costco. Media coverage of preteens and soccer moms striking it rich made Beanie Babies look like a can’t miss opportunity to strike it rich. The end came suddenly at the start of 1999. Warner over-saturated the market with too many different kinds of Beanie Babies and turned off collectors. There were more sellers than buyers and kids had moved on to Pokemon. By November 2000, Beanie Babies were showing up in discount dollar stores. No one seemed to care when Warner announced he was retiring Beanie Babies and then reversed course. Warner claimed losses of more than $39 million in 2004. In the Fall of 2013, Warner plead guilty to tax evasion and was sentenced to two year’s probation and 500 hours of community service. 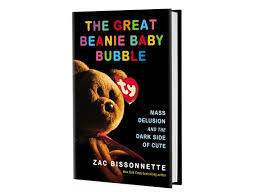 Before we lose our minds in the next inevitable speculative bubble, we’d do well to read Bissonnette’s book and remember that something’s only worth what someone else is willing to pay for it. Warner’s life story would also make for a great life-is-stranger-than-fiction mini-series on HBO or Showtime.